Present your work in high detail using the HP Designjet T2530, built to complete more work in less time at higher quality it uses six original HP Inks including gray and photo black for crisp fine line details. Producing stunning map artwork, technical and line drawings accurately is easy thanks to the 2400 DPI print resolution and the optional PostScript printer for even higher resolution prints. 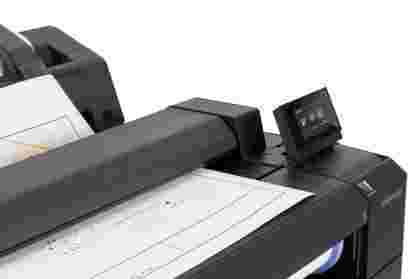 A convenient easy to use control panel enables users to scan, print and copy all from the printer. The HP Designjet T2530 sends prints to be collated either to the 50 page output stacker for easy retrieval or the media bin, depending on the print settings. It takes two rolls of 36in media helping teams accomplish more in less time. The T2530 also allows users to print directly from their Apple or Android powered smart device. 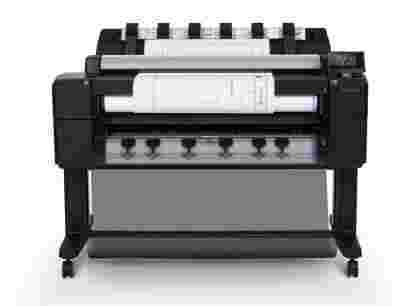 Upgrade and integrate the HP Designjet T2530 into any office network easily. Designed to be less effort to manage users and IT Managers can gain full control of the printer through the touch control panel where you can monitor jobs, track printing status and previous print jobs. If you need additional security the HP Designjet T2530 comes with IPSec, NTLMv2, SNMPv3, 802.1X, PIN printing, and more security options to give you complete peace of mind.